Without a doubt, Executive Producer and Game Designer Todd Howard stole the show with his appearance at the Bethesda conference during the 2018 E3 convention. He was preceded mostly by what felt like an awkward middle school dance, but presented himself as the guy who goes home and bleeps the prom queen. He did so in the most humble fashion possible, however, by starting out with a littler self-deprecating humor. Given that porting Bethesda’s “The Elder Scrolls: Skyrim” to every platform imaginable has taken on a life of its own as a sort of meme, Howard began his presentation with a farcical video involving a port of Skyrim to Amazon’s Echo. From here, minds were blown. Howard shared that this was his 25th year with Bethesda, and reminisced about E3’s in the past, commenting on the growth of the convention. It’s good that the convention has become what it has, because it took a big stage to hold Howard’s announcements in regards to Fallout 76, none-the-least of which is the fact that you won’t have to wait nearly as long as you think to sink your teeth into this dream, it’ll be here in November of 2018. Despite each of the previous Fallouts (except Fallout Shelter), back to the original Interplay game, moving forward along the timeline, Fallout 76 is taking us way waaaaay back to the beginning, in the first prequel of the franchise. What we see of the wasteland in the first gameplay trailer (oddly enough debuted during the Microsoft conference), is a whole new wasteland. One that takes place in the majestic green speckled hills of West Virginia. A West Virginia spanning 6 regions and covering 4 times the ground as Fallout 4. Howard shares with us that Vault 76 was designed to open on and celebrate the tercentenary of America, from 1776 to 2076. Birth to rebirth. Your character is part of a cadre of the very elite, selected to be an occupant of Vault 76. 25 years are spent within the Vault until Reclamation day. 300 years after the year of America’s first Independence day. The day the vault is opened. In the first part of the video below, we see what appears to be the very first steps a player might take into the new world of West Virginia, before Howard talks to us about the improvements to the engine that Fallout runs on, allowing for impressive new graphics features, including long distance weather rendering. Next he shares with us some of West Virginia’s features, and shows that it’s more than just a pretty John Denver song. He talks about the state’s natural wonders, towns, and even folklore, and how they are all acclimated into the game. From Mothman to the Beast of Grafton, from the West Virginia state Capital of Charleston to the ruins of the famous New River Gorge Bridge, players will feel immersed in Fallout 76’s version of West Virginia. The real bomb was dropped at the conclusion of this video, though. Howard states that Bethesda has always wanted to tell the story of the opening of the first vault. What makes this story extra special, though, is that each member of Vault 76 will be played by a real person. That’s right, Fallout 76 will be an MMO. Howard first says that F76 is entirely online. He quickly assures people that there will absolutely be a solo experience before going on to discuss the desirability of a shared Fallout story experience. 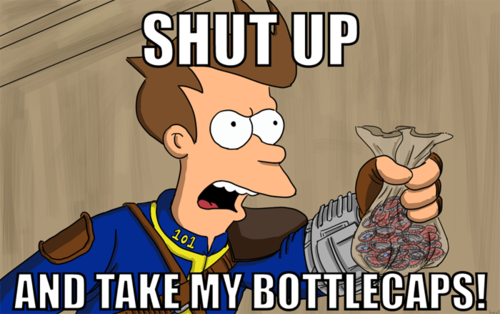 For 4 years Bethesda has been planning such an endeavor, unable to shake the concept of a Vault occupied entirely by players. He suggests that Fallout 76 should be considered a “Softcore Survival” game (though not in the way that one might describe Softcore in relation to late night cable shows), then promises that dying will not result in loss of progress or character. Howard continues, saying that a player will never see a server selection screen, and that they can expect to see perhaps dozens of players on a server, but never hundreds or thousands, like other MMOs. Progression it seems will be tied to a character on an account, rather than on a server, and a player can join their friends at any time, on any server. The world of Fallout just got a whole lot bigger, and perhaps a whole lot scarier. Don’t worry though, Vault-Tec prepared this informative video to help you, and your friends, navigate the wastelands. Because of course they did. What we see here is… well, it’s just beautiful. It’s not a Fallout MMO like Elder Scrolls Online is an Elder Scrolls MMO. No, it’s Fallout, in multiplayer mode, online. No tab targeting, active use of cover, a REAL LMG, and the mother of all Flintlock pistols. This game is Fallout, through and through, but with 100% more Tuba. We get emotes, crafting stations, and mutant tree sloths. Don’t worry, though, you’ll still get to fight deathclaws. One of the more popular features of Fallout 4 was definitely the building system. Given that you’re going to be one of the first humans to enter the local wastelands, you’re obviously going to need somewhere to hang your fedora. With Fallout 76’s new C.A.M.P. (Construction and Assembly Mobile Platform) system you’ll not only be able to set up a base, complete with defenses, you’ll seemingly be able to pack up that base and move to a new location. Bases will apparently be subject to attack from the denizens of the wastelands; both irradiated foes and former Vault companions. Oh, and players will also be able to acquire nukes. What would a post-nuclear apocalypse be without more nuclear bombs? Players will be able to team up and assault bases wherein nuclear codes can be obtained, similar to dungeons in other MMOs. Once launched, it appears as though the nukes will not only deal with pesky neighbors the way a bug zapper deals with mosquitoes, but will also leave behind an irradiated field which will offer opportunities for rare loot to players. The geniuses at Vault-Tec aren’t done yet, though. They’ve also devised a plan most ingenious: The Break-it Early Test Application, or BETA for short. Bethesda will be accepting players to participate in said BETA, in order to make sure that Fallout 76 isn’t a bug-riddled mess, like some titles that we won’t mention. Hey, did you hear? It’s 2018. That means that you can’t release a Triple-A title without a Collector’s edition! Let’s face it, in the case of Fallout, we wouldn’t want them to. The CE for Fallout 76 is going to offer a map of the game world that glows in the dark. Yeah, you heard me. It glows in the dark. You know you want one, and no, you can’t have mine. There are also little figures that can be placed on the map, or a shelf, or, well, don’t put them anywhere that would get you on the news. Plus… uh…. the collector’s edition will come with a T-51 power armor helmet, complete with functional light and voice modulation unit. Access to the beta appears to be coming with either Power Armor edition, or standard pre-orders, but the date for standard pre-orders has not yet been announced. As said earlier in the article, you only have to wait until November for all of this delicious goodness, but if you’re now chomping at the bit to get a Fallout fix, Howard also announced that Fallout Shelter, now celebrating its 3rd birthday, is coming to Playstation 4 and Nintendo Switch, 100% free, effective immediately. Having already reached over 120 million people, Fallout Shelter is really an engaging little game, and if you haven’t played it, I highly recommend you try it out. That’s it for the Fallout segment of the 2018 Bethesda E3 coverage. Make sure to check out the articles covering the Elder Scrolls announcements, as well as all of the other Bethesda offerings including the new Wolfenstein and Doom games coming this year!